Absolution, a unique and mysterious work by Auguste Rodin, has gone on display at Paris’ Musée Rodin for the first time since its creation in around 1900. Very little is known about this sculpture. There is no documentation about it in the artist’s archives, and he never made a marble, terracotta or bronze version of it. 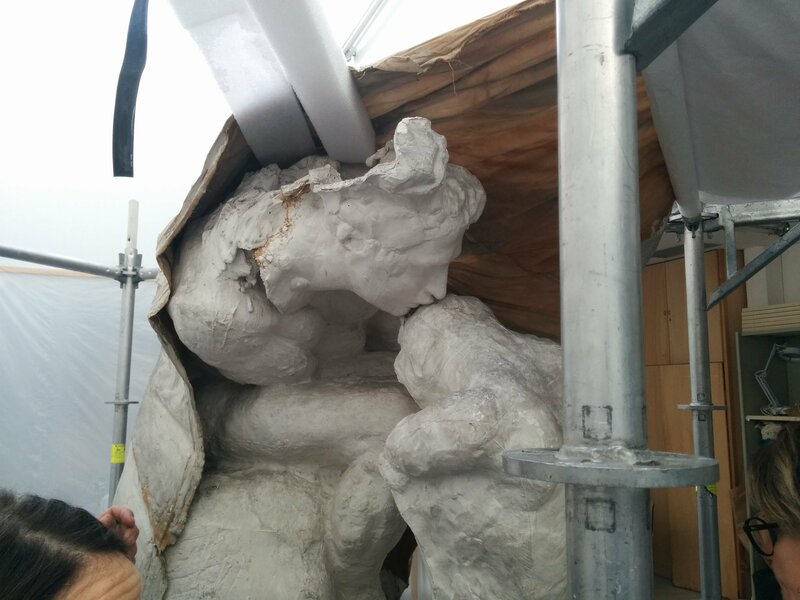 It’s such an experimental piece with no directly comparable works in Rodin’s oeuvre that curators aren’t even sure if it’s finished. The fact that he kept it at all suggests Rodin was at least satisfied with it. It has never been exhibited before because it is incredibly fragile. 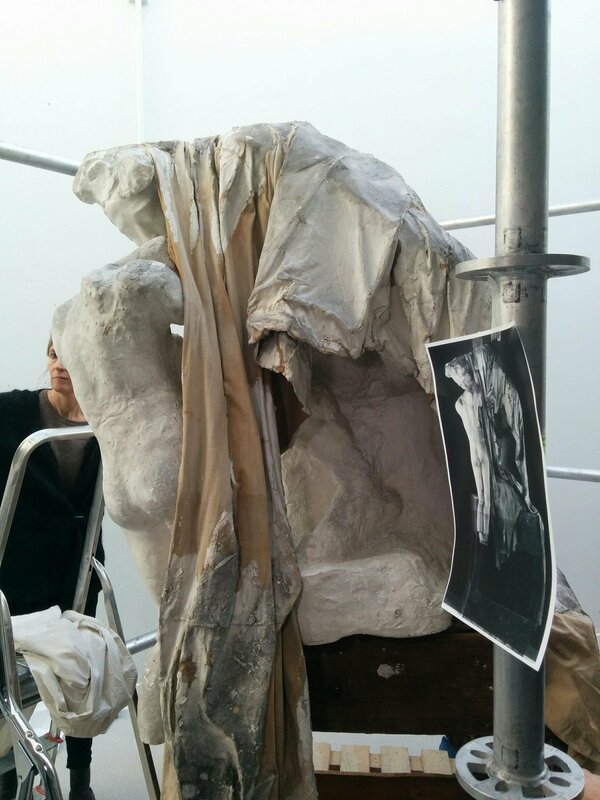 Three plaster sculptures are draped with a fabric coated in plaster, the latter of which posed a particularly thorny conservation challenge. It was kept in storage wrapped in paper, and when conservators removed the wrapping, they found the piece coated in dust and broken in several places. 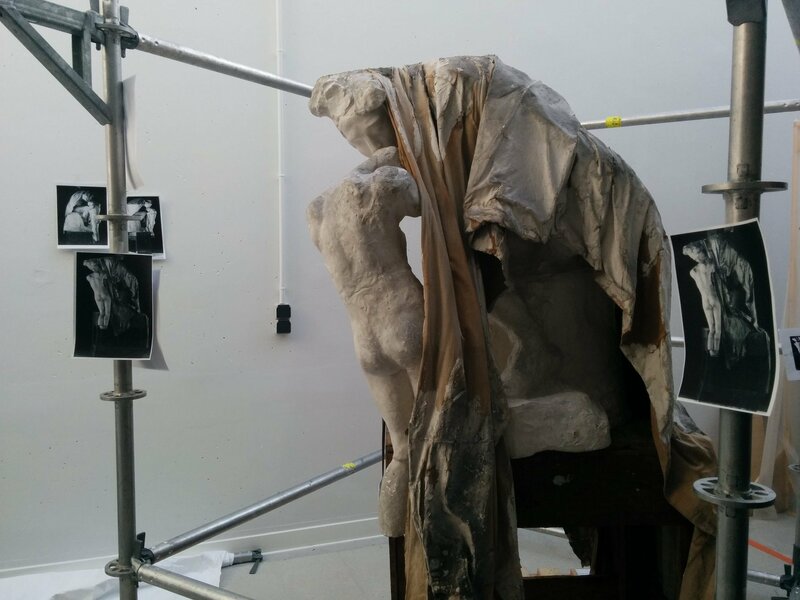 The three plaster figures had come apart and the fabric had lost a good portion of its plaster coating. In order to even get to the figures, the draping had to be lifted which, given its extreme fragility, was a risky operation. Then the broken figures had to be put back together and the fabric, cleaned and repaired, put back in place. They had to accomplish all of this with just an old black and white photograph of how the sculpture had once looked to go on. This video shows the difficulties conservators had to overcome to stabilize Absolution enough to put it on display, albeit in a glass box to protect it from even the smallest breeze that might cause the textile to move. Rodin was one of the first sculptors to include textiles in his artworks. 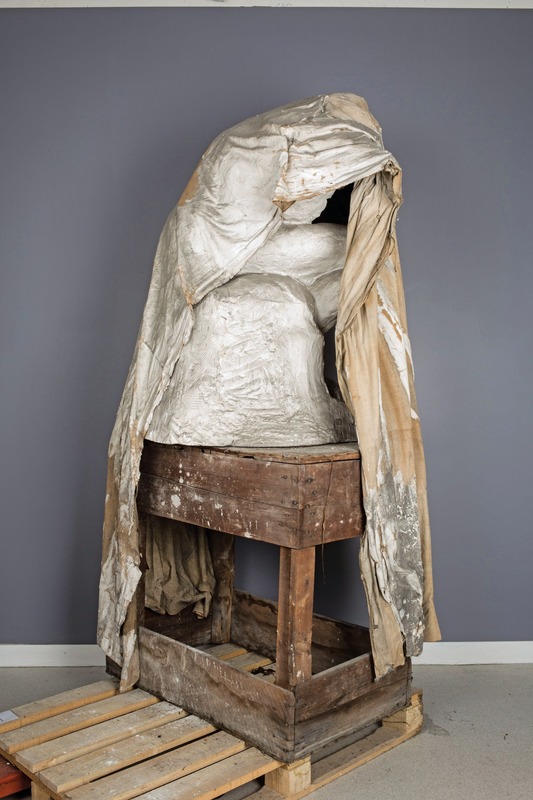 He took advantage of the flexibility of the medium to drape and mold the fabric, which he would then coat in plaster. The integration of textiles lent his sculptures a soft, fluid element in marked contrast with the hardness of plaster and stone. In Absolution the textile envelopes the figures of a man, Ugolino della Gherardesca, betrayer of his benefactor, condemned to the lowest circle of Hell in Dante’s Inferno; a woman, representing the Earth; and the head of a martyr. The draping obscures many details of the sculpture within, framing and highlighting the thematic significance of the kiss of forgiveness, the eponymous absolution. Absolution has been on display since last month at the Kiefer-Rodin exhibit. The exhibition commemorates the centenary of Rodin’s death by pairing his work with pieces by contemporary artist Anselm Kiefer that were inspired by sculptures and drawings by Rodin. Like Rodin, Kiefer experimented with contrasting media, hard and soft, textile and stone. By putting Kiefer and Rodin together, the exhibition emphasizes the modernity of Rodin’s vision. It will run through the end of the year. 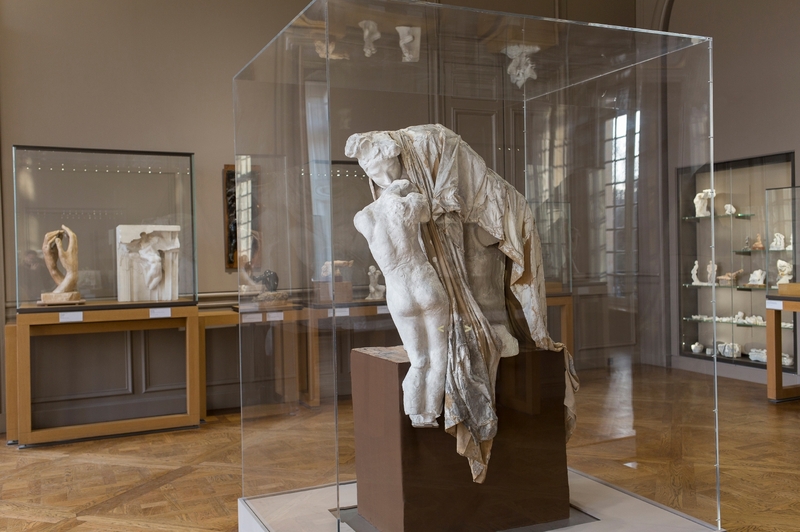 The original plan was for Absolution to travel to the Barnes in Philadelphia where it would be on display from November 2017 until March 2018 before returning for permanent display in Paris, but the Musée Rodin’s conservators determined that it is impossible to transport the delicate sculpture anywhere, never mind across the Atlantic, without damaging it. The textile is the main sticking point. Any vibration or movement can cause the gypsum to flake off, and because of the way it is draped over the plaster figures, it can’t be packed or wedged in a way that supports it during transit. Figuring out protective packaging for the textile would be so complex and experimental an engineering challenge that the Musée Rodin is unwilling to take the risk. So Absolution is staying in Paris, safe from people’s breath and air currents in its glass box.